Despite widespread opposition from many in the Fort Point Channel neighborhood, the Boston Redevelopment Authority's board of directors voted 5-0 on Thursday to approve plans by developers Archon Group and Lincoln Properties to renovate and expand historic warehouses at 49/51/63 Melcher St. and 316-322 Summer St. for use as office buildings. Just three years ago, developers and the city planning officials touted the buildings as part of a comprehensive revitalization effort that would transform the once run-down industrial area into a lively neighborhood with new housing, shops and restaurants, and parks. 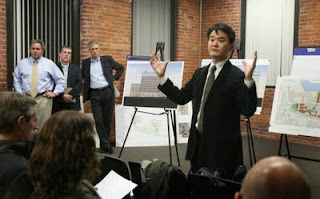 In a tense and sometimes confrontational community meeting held last Monday night, dozens of artists and other Fort Point residents took the developers and the BRA's chief planner, Kairos Shen, to task for plans that involve evicting more than 70 artists and arts-related small businesses from two warehouses to make way for more office space. "You lied to us. You have not kept one promise to the community," said artist Claudia Ravaschiere, a former president of Fort Point Arts Community. Ravaschiere blasted representations made by executives from Archon and Goldman Properties since first purchasing 17 buildings in Fort Point back in 2005. "To you, it's just real estate, but to us, it's a neighborhood," she said. Though both properties are zoned for a mix of commercial and residential uses, developers say the current real estate market will only support office space. Archon's John Matteson defended his firm's efforts, saying the company has upgraded a number of mostly-vacant buildings and filled them with commercial tenants who are bringing much-needed foot traffic to the area. Both projects will be subject to further design review by the BRA to scale back the height of planned rooftop additions and still need approval from the Zoning Board of Appeals before moving forward, said Susan Elsbree, the BRA's director of communications. Critics say the city's support for these plans abandons core principles of the BRA's 100 Acres Master Plan that pledged to bring equal amounts of housing, retail and other businesses and office space to the area. Adding more offices doesn't improve the quality of life for residents and pushes still more artists out of the neighborhood, they said. "This is a situation of the BRA supporting the developers and not supporting the community," said resident Valerie Burns, who serves on the city's study committee considering whether to designate Fort Point as a landmark district. .
"Fort Point is the back office of the Financial District. That's how they see it," said resident Steve Hollinger, cofounder of Seaport Alliance for a Neighborhood Design (SAND). He accused the BRA of "reselling variances" to developers who buy buildings in the area, obtain the city's permission to add valuable roof-top additions and other special zoning expansions that provide little public benefit and are often done over the objections of residents, and then unload the properties for a hefty profit. Hollinger said developers are hiding behind the current economic crisis to avoid creating more housing because it's more profitable to build office space. 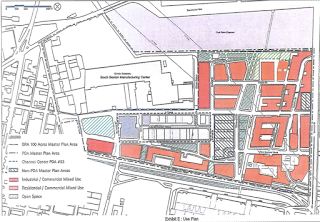 Shen conceded the projects fall short of the goal of creating more housing in Fort Point but said the BRA was asked by Mayor Thomas M. Menino to review all stalled building projects with 'burdensome' residential restrictions. "The Mayor wants to see these projects move forward," he said. At only 50,000 square feet, Shen added, the Melcher Street project is small and will generate $500,000 in linkage payments to the city to go toward creating parks and other open spaces in Fort Point sometime in the future. Lincoln Properties will contribute $340,000 and spend another $680,000 to upgrade 319 A St. to accommodate displaced artists. Shen conceded local parks are not likely to be built any time soon since the city must wait until more buildings are developed to have enough money to start work on them. Heidi Burbidge, the BRA's senior project manager for the Artist Space Initiative, said about 72 artists, plus some additional arts-related businesses, face eviction from 337 Summer St. and the front portion of 319 A St. Under a plan hatched a few weeks ago, Burbidge said, all are eligible to move into the rear portion of 319 A St., though she estimated probably only about 40 or so will take up the relocation offer since some had already moved out before the city stepped in, fearing the worst. In late 2007, Archon terminated the tenancy of artists and small businesses in the Melcher Street buildings. Nearly two years ago, artists in 327 Summer St. were evicted, said Burbidge. Though less than ideal, the short-term deal was the best the city could come up with, said Shen. "Two years is better than nothing at all." Studios will be rented at $9 per square foot, a rate comparable to what most are now paying, he added. Shen said the city plans to eventually acquire 327 Summer St. from Archon and convert it into permanent live/work space for artists but conceded that project wouldn't be ready by the time leases for the artists expire in two years because the city doesn't have the money available yet.